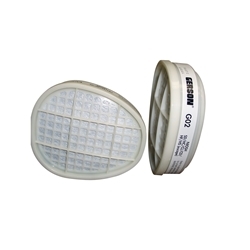 Fits Gerson Full Face & Half-Mask Cartridge Respirators. • Low profile, swept-back cartridges for greater field of vision and use with eyewear/goggles. Sulfer Dioxide, Hydrogen Chloride, Chlorine, Hydrogen Sulfide (escape only), Chlorine Dioxide, Hydrogen Fluoride. PACKAGING: 2/bag, 30 bags/cs, 60/cs Part Number: 0871479. Categories: Respiratory-NIOSH Approved, Cartridges & Filters.